Like the singles chart this week, we also have a new record set on the albums chart this week, as the “Trolls” soundtrack holds for a second week atop the ARIA Albums Chart. With “Trolls” holding the top for a second week, it becomes the longest run at the top for a cinema soundtrack (not TV soundtrack) since Feb 2015’s “Fifty Shades of Grey” spent four weeks at the top. But the record achieved this week is the fact that the top three albums are all for soundtracks, plus they are all for animated films too. Moving up one place each to new peaks are “Sing” (3 to 2) and “Moana” (4 to 3), with the Disney film ‘Moana’ seeing three tracks within the Top 100 singles chart this week also, and a first for one of the films stars in Dwayne Johnson (yes ‘The Rock’). After climbing back to No.2 last week, the Adele “25” album is back down two places to No.4, and should remain this high until after she finished her tour here in late March. The next two albums are on hold this week, with The Rolling Stones at No.5 with “Blue & Lonesome” and at No.6 is Keith Urban’s “Ripcord” set. Climbing back up three places to No.7 is The Weeknd and “Starboy”, matching the #7 spot his song also occupies over on the singles chart, whilst down one spot to No.8 is Bruno Mars’ “24k Magic”. Returning to the Top 10 for the first time since May 2016 is the second Ed Sheeran album “x (Multiply)” for an 86th week within the Top 10, all due to the fact that he scored the top two entries over on the singles chart this week. And finally matching last week’s record for four soundtracks within the Top 10 is the “Suicide Squad” album, down one to No.10. * Australia could have seen FIVE soundtracks within the Top 10 this week if last weeks No.31 entry for seven times Golden Globe-winning film “La La Land” had have gone a little higher, but still an eighteen place jump to No.13 is impressive, and we could see the album rise into the ten next week possibly. * Adele’s second album “21” (269th week within the Top 100) is back up five to No.23, whilst her debut “19” album rises eight to No.59. * For the second week in a row the Childish Gambino album “Awaken, My Love!” rises, this week it is back up six to No.28. * The debut album for Ed Sheeran in “+ (Positive)” is back into the chart at No.32 too. * This past week was the one year anniversary of David Bowie’s passing, and his latest collection in “Legacy” (former peak No.39) charges back up twenty-four places to land a new peak of No.37, whilst smaller climbs occur for his two other chart entries at the moment, “Nothing Has Changed” (75 to 71) and “Blackstar” (84 to 78). * Three albums returning to the Top 50 this week are “The Best of” for The Wiggles (55 to 42), “50 Best Songs” by Play School (83 to 48) and the Hillsong Worship set “Let There Be Light” (58 to 50). * From next Friday (20th Jan) Nick Cave & the Bad Seeds will be touring the country in promotion of their second No.1 album “Skeleton Tree”, which this week is backup twenty-seven places to No.55. * Violent Soho are playing the ‘UNIFY – A Heavy Music Gathering 2017’ festival this weekend in Victoria, and their “WACO” album is back up thirteen spots to No.61. * Further re-entries to the albums chart are “Best of Nickelback Vol.1” (#72), “Matilda the Musical” (#76) and “Currents” by Tame Impala (#79). Passenger will be here next Friday touring too, and his latest set “Young as the Morning, Old as the Sea” (HP-1) is back in at No.89, followed by the “Frozen” soundtrack (#95), “Blue Neighbourhood” for Troye Sivan (#98), “22, A Million” for Bon Iver (#99) and Empire of the Sun with “Two Vines” (#100). * After returning to the Top 10 last week for the first time this century, the George Michael best of set “Ladies & Gentlemen” (HP-2, WI10-15) is back down three spots to No.11, whilst his other collection “Twenty-Five” descends twenty-eight places to No.41, and his “Faith” album plummets fifty-two places to No.88. * Coldplay drops nine to No.26 with “A Head Full of Dreams”, whilst their “4CD Catalogue Set” drops twelve to No.60. * Michael Buble is down nine to No.29 with “Nobody But Me”. * Falling twelve to No.36 is the second Shawn Mendes album “Illuminate”. * Down ten spots to No.39 is Leonard Cohen’s last studio album “You Want it Darker”. * After leaping back into the Top 30 last week, “Blurryface” for twenty one pilots is back down seventeen spots this week to No.43. * Falling twelve places apiece are Drake with his “Views” (32 to 44) and “This House is Not for Sale” by Bon Jovi (33 to 45). * Prince drops twenty-six places to No.56 with his collection “The Very Best of”. * J. Cole descends sixteen spots to No.62 with “4 Your Eyez Only”. * After zooming back up to No.52 last week, Halsey is back down twenty-five places to No.77 this week with her debut set “Badlands”. * And after jumping back into the Top 50 last week, the Rufus album “Bloom” is back down thirty-five this week to No.85. * The weekly bounce for A Tribe Called Quest continues, as “We Got it from Here…” again suffers a massive drop, this week back down thirty-two places to No.91. * There are no more Christmas albums left on the chart this week, with the last two leaving this week from John Farnham & Olivia Newton-John (#53, highest drop-out for this week), and the Michael Buble set (#85). * #15 (LP#9) 11 Short Stories of Pain & Glory by The Dropkick Murphys is the highest new entry for this week, the band’s ninth studio album and fifth entry here is now also their highest charting album, beating the No.23 peak of their January 2013 album “Signed and Sealed in Blood”. They first charted here with their fifth album “The Warriors Code” (HP-80, June 2005). * #20 (LP#5) Night People by You Me at Six becomes the band’s third ARIA Albums Chart entry and now second Top 20 album, as their last effort “Cavalier Youth” (Feb 2014) debuted and peaked at No.14. * #30 (EP#9) Reanimate 3.0: The Covers EP by Halestorm is the first chart entry here for the US hard rock band, who have had three studio albums and now this is their ninth EP, as the title suggest this is their third covers EP. * #63 (LP#2) Lighthouse by Ashleigh Dallas is the second album for the Tamworth country singer and Golden Guitar winner, and her first to chart within the ARIA Top 100 Albums. * #83 (EP#6) Loose Change EP by Ed Sheeran was his sixth EP released originally in February of 2010 and is charting due to his two new singles from his early March third album debuting in the top two spots on the singles chart this week. 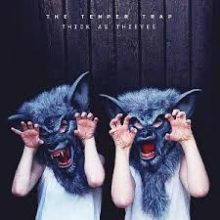 The third album for local rock act The Temper Trap entitled "Thick as Thieves" becomes the bands second consecutive No.1 album and third Top 10 set, entering at the top of the ARIA Albums Chart this week.